One of our most beloved silhouettes, the Classic Mini is an icon of casual style. 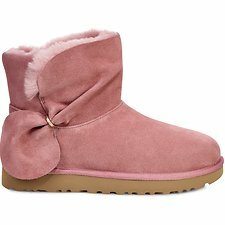 This boot delivers our signature UGG wearing-experience with luxurious Twinface sheepskin, a plush wool insole, and a lightweight, flexible outsole. Updated with a playful twist, this best seller pairs well with suits (with the trouser legs cuffed up) and boyfriend jeans.